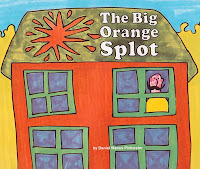 The Great Monday Give for today is an awesome but not-so-vintage paperback copy of The Big Orange Splot. BEST BOOK EVER. Live it, love it and pass it on. To be entered to win, simply comment on this post before midnight ~ July 12 ~ Sunday. A winner will be selected by the highly-technical blind scroll and point method and announced the following day. And now, the winner of last week's give, her very own copy of Where the Wild Things Are.... Lise!!!! Congrats and send me your mailing info to webe(at)soon(dot)com. So long sillies. Wow at the "BEST BOOK EVER" comment--that's high praise coming from you! I would love this book. Our library system doesn't have it so I can't even borrow it for my son! yes, I would like to have the best book ever. fingers crossed. Must see this book, the "Best Book Ever"! Here's hoping! cute! I don't think I've ever read that book. Count me in. We can never have enough books! This one's new to me too. This sounds like a really good one! Gosh, I remember checking this book out of the library ages ago and LOVing it, but I can't remember why! (3 kids + aging + summer vacation = no memory to speak of) I would love the opportunity to see it again! Love your and added it to my favs...check out my blog: www.well-lovedtales.blogspot.com. Looks great--I'd love to read this with my kiddos. What a cool looking book. Went back are read your review, and am hoping for a chance to win! Thanks! Hmm..Best Book Ever? A must have, then! Orange is our favorite color at our home. Could be because my husband is a huge Tennessee fan. :) Anyway we would love a copy of this book. I had never heard of this book. Looks like a great one to add to our collection. Wow! I would love this book! Thanks. I'd love to give this book a chance with my kids (hmm, from the writer who brought us "Big Bob and the Magic Valentine's Day Potato"). Thanks for giving us a chance to get it! I vaguely remember this one... sounds like so much fun!!! I'd love a copy of this! Not in our library system either, unfortunately. I love this book!!! In fact, my graduate thesis, in which I look at the interiors of immigrants homes, made many references to the story of the book. So, so good. Oh I forgot about this one! It WAS awesome.